While the Texas House on Thursday voted to defund a controversial economic development program and put the money toward services for vulnerable children, a group of Tea Party Republicans complained about the way the vote was handled. The Texas House on Thursday voted to defund Gov. Greg Abbott’s Texas Enterprise Fund, a controversial economic development program, and use that funding for services for vulnerable children. But the vote, made quickly and without a record of members’ positions on it during a marathon debate over the House budget, led to an impassioned speech from a Tea Party Republican over what he alleged were the House’s sneaky methods of avoiding difficult votes. “My voice has been silenced by a bunch of manipulation of this booklet right here,” said Tea Party firebrand Rep. Jonathan Stickland of Bedford while gesturing at the House’s rule book. The amendment in question, by state Rep. Sergio Muñoz, D-Palmview, would take $43 million from the Texas Enterprise Fund, the "deal-closing" fund the state uses to lure businesses from elsewhere, and divide it into two equal pots: one for Child Protective Services and foster care funding, the other for a program that pays for disabled children’s physical, occupational and speech therapy services. Both are hot-button issues that have dominated the House’s budget negotiations during this legislative session. Following the vote, a group of Tea Party Republicans in the House were livid despite their longstanding opposition to the enterprise fund as an example of unwarranted meddling by state government in the free market. Several took issue with the way the amendment was passed. Some Republican members had filed their own amendments to take funding from the enterprise fund and move it to other government programs, but those proposals were voided after Muñoz’s amendment drained all of the fund's available money. The unusual way in which Muñoz managed to pass his amendment began with the passage of an earlier budget amendment that drew its own fireworks. The House voted 103-44 to prevent money from being spent on programs using taxpayer money to subsidize private school tuition. Immediately after, a group of Tea Party Republicans who opposed the amendment quickly huddled near the Speaker’s platform in order to challenge it. Around that time, Muñoz went to the front microphone to announce a change to one of his amendments dealing with the Texas Enterprise Fund, which would redirect money to vulnerable children. There were no objections. Muñoz’s freshly amended amendment was then put to a vote while the crowd of mostly Tea Party lawmakers was still gathering over the private school choice amendment. Again, no objections were heard in the House, and Muñoz’s amendment passed. When Stickland and others, including state Rep. Scott Sanford, R-McKinney, realized what had happened, they immediately challenged the passage of Muñoz’s amendment. They were overruled. But Sanford’s motion to reconsider the original vote failed, 18 to 127. 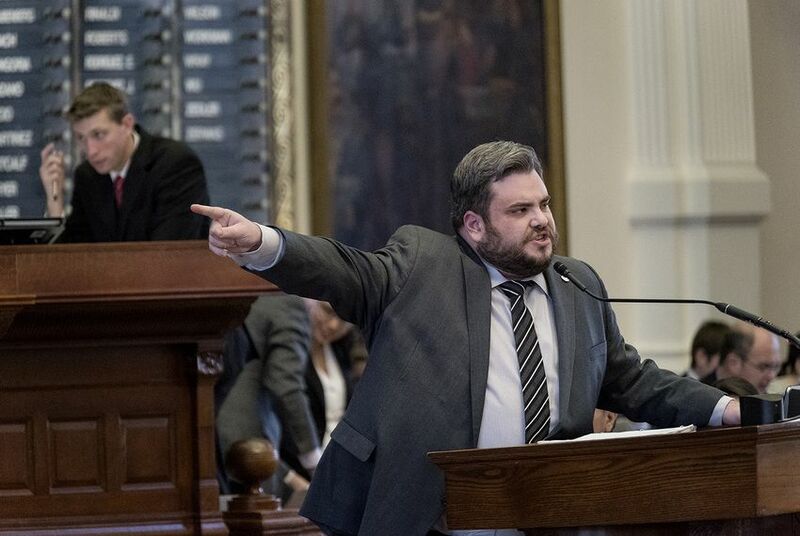 Stickland then took to the back microphone to deliver an impassioned speech, at times raising his voice to a yell, after his attempts to reverse the Muñoz amendment failed. The amendment’s passage without a record vote is “one of the most offensive things and disgusting things that I have ever seen in this body,” Stickland said. Voters, he said, "have a right and an expectation to know where every single of one of us stand on every single issue." The 16 members who voted to reconsider the Muñoz amendment other than Sanford and Stickland were: state Reps. Kyle Biedermann, R-Fredericksburg, Briscoe Cain, R-Deer Park, Yvonne Davis, D-Dallas, Pat Fallon, R-Frisco, Cole Hefner, R-Mt. Pleasant, Stephanie Klick, R-Fort Worth, Matt Krause, R-Forth Worth, Mike Lang, R-Granbury, Jeff Leach, R-Plano, Matt Rinaldi, R-Irving, Matt Schaefer, R-Tyler, Mike Schofield, R-Katy, Matt Shaheen, R-Plano, Valoree Swanson, R-Spring, Tony Tinderholt, R-Arlington and Bill Zedler, R-Arlington. Asked about the House's decision to defund a program that Abbott had asked lawmakers to fully fund earlier in the session, Abbott spokesman John Wittman said, "It’s still early in the process. As we get closer to a final budget, we believe the Legislature will ultimately fund critical economic development programs that create jobs and keep Texas in the vanguard of attracting new businesses in the future."